We set the standards of excellence from inception to completion. Grand Doors acclaimed installation team consists of craftsmen with years of experience, which is a specialty in itself. Whether it is new construction or replacing old doors or landmark doors, expect nothing less than perfection. We set the standards of excellence from inception to completion. From taking the preliminary measurements and responsibility for unit to fit, through fully installing the unit with all the hardware, we orchestrate it with precision and master craftsmanship. No situation is too difficult for us. Our specialty is renovations and custom homes. 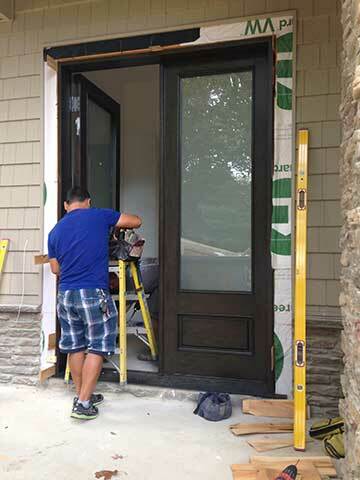 We supply and install fiberglass and custom wood exterior doors, with total door frame, trim and hardware. Grand doors Inc is properly insured and bonded. All our doors are high end manufactured so we can offer our clients the very best product, We have earned a sterling reputation with our unsurpassed service and superb craftsmanship.